Should it be this hot in October? By this time of the month, I expect a nice Autumn breeze as the leaves on trees are starting to turn color and scattering all over the streets. It was so hot over the past few days that I don’t even want to be in the kitchen cooking, but since both Jane and I need food for lunch tomorrow, I open all the windows in the kitchen at around 20:30 when it’s much cooler to whip up something quickly. The other day I went to Lucky and bought an 8lb. Pork Loin for my Mexican feast and since I’m all Mexican-fooded out, I wanted to make some Vietnamese Pork Loin Chops with Rice and Egg. While I was cooking, I wondered if there is a difference between Pork Loin and Pork Tenderloin. Did you know there was a difference? I Googled it. Apparently, the pork loin is the large muscle running along the pig’s spine while the pork tenderloin is a smaller muscle running underneath it. The pork tenderloin gets less of a workout and is therefore a little more tender than the loin muscle. Whatever the difference is, I’ll just get the pork loin since it’s much cheaper than the tenderloin and still taste excellent. Anywho, since it was late already, I didn’t have time to set up the charcoal grill to grill (you can use the George Foreman Grill too and it works great) the pork, so I pan-fried it instead. The pan-frying method works fine, but the only problem is that after frying the first batch, the burnt pieces hang out in the pan and might cling on to the next batch of pork and make it look burnt. So….after frying the first batch, I took a silicone spatula (the ones you would use for baking) and scraped off all the burnt bits and pieces in the frying pan, leaving the oil, before pan frying the next batch. It seemed to work and the pieces of pork loin chop were not totally black! In a large bowl, whisk fish sauce, honey, sugar, crushed black pepper and set aside. Dice scallions, shallot, garlic and cloves and put it in a mortar. 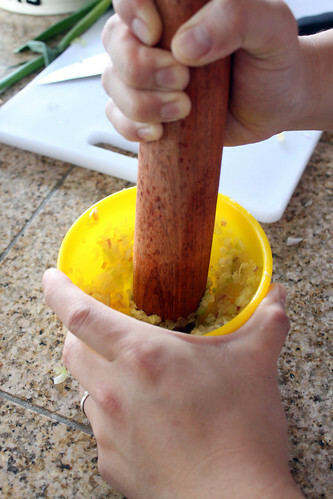 Add a little bit of the fish sauce liquid into the mortar and crush contents in the mortar with a pestle until everything is crushed. Scoop out mixture from mortar into large bowl of marinade and whisk until all the ingredients are combined. Slice the pork chop horizontally into about 1/3 inch slices. If you like it thicker, slice it thicker. Take a meat tenderizer and whack the pork loin chops a couple of times and continue with all pieces of pork loin chop. 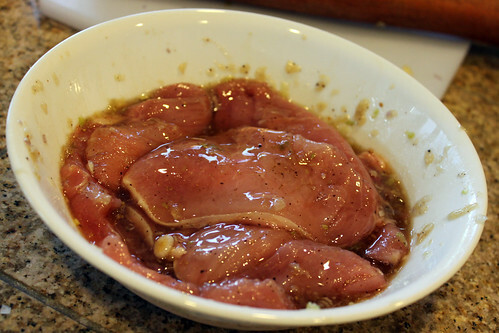 Add pork loin chop to marinade and mix until the pork loin chop is evenly coated with the marinate. Add 1 tablespoon vegetable over the top of the pork marinade and marinate for at least 1 hour. Heat up Frying Pan to Medium High. Add ~1 tablespoon vegetable oil and cook each side for about 2-3 minutes or until browned. 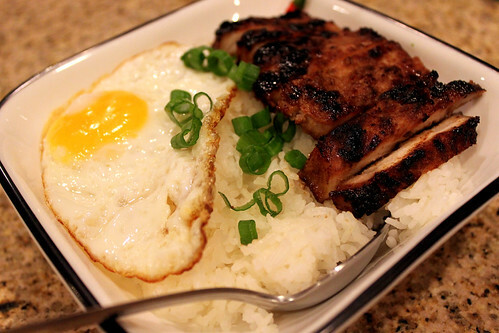 Fry an egg (however you like) and set aside. 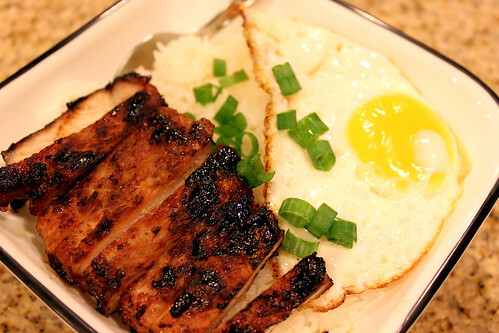 Serve with rice and eggs or however you want to enjoy it.